Omega “My Special Someone” Valentine’s Contest! | Much Prosperity Trading International Inc.
Omega “My Special Someone” Valentine’s Contest! 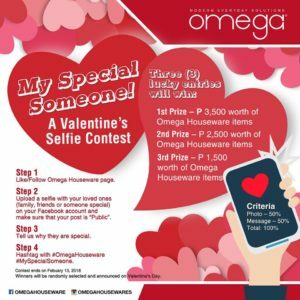 Post a selfie with your special someone for a chance to win Omega Houseware items this Valentine’s Day! Join now! See artwork for contest details and mechanics.